Shrubs , deciduous, 0.4-2 m. Stems dimorphic, with long primary shoots and short axillary shoots. Bark of 2d-year stems purple or brown, glabrous. Bud scales 1-1.5 mm, deciduous. Spines present, simple or 3(-7)-fid. Leaves simple; petioles 0.2-0.8(-1.3) cm. Leaf blade oblanceolate or sometimes narrowly elliptic, 1-veined from base, 1.8-7.5 × 0.8-3.3 cm, thin and flexible, base long-attenuate, margins plane, toothed, each with 3-12 teeth 0-1 mm high tipped with bristles to 0.2-1.2 × 0.1-0.15 mm, apex rounded or rounded-obtuse; surfaces abaxially dull, smooth, adaxially dull, ± glaucous. Inflorescences racemose, lax, 3-12-flowered, 2-5.5 cm; bracteoles membranous, apex acuminate. Flowers: anther filaments without distal pair of recurved lateral teeth. Berries red, oblong-ellipsoid, 10 mm, juicy, solid. 2 n = 28. Flowering spring (Apr-May). In woods or glades, on rocky slopes and near rivers; 100-700 m; Ala., Ga., Ill., Ind., Ky., Md., Mo., N.C., Pa., Tenn., Va., W.Va. Berberis canadensis is susceptible to infection by Puccinia graminis . 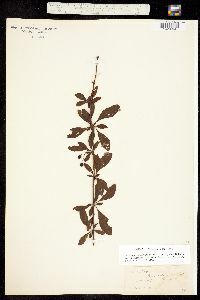 The Cherokee Indians used scraped bark of Berberis canadensis in infusions to treat diarrhea (D. E. Moermann 1986). Shrub 40 cm - 2 m tall Leaves: alternate, stalked, dull green, 1.8 - 7.5 cm long, 0.8 - 3.3 cm wide, narrow elliptic to spoon-shaped or narrow and inversely egg-shaped with a rounded to blunt tip, gradually tapering to the base, with three to twelve spine-tipped teeth per side, firm at maturity, more or less covered with a whitish waxy coating (glaucous). Flowers: borne three to twelve on a loose inflorescence 2 - 5.5 cm long, subtended by membrane-like bracts with pointed tips. The six yellow petal-like sepals fall soon after flowering, each of the six yellow petals has a notched tip and two basal glands, and each filament lacks a pair of curved lateral teeth. Fruit: a red berry, 7 - 10 mm long, egg-shaped or oblong to elliptic, juicy. Twigs: purple to brown, becoming gray, slightly angled, usually with three-pronged spines. Form: upright, sparingly branched with long branches and short lateral branchlets, often suckering and forming colonies. Similar species: Berberis aquifolium and Berberis repens both have leathery compound leaves and bluish black berries, and they lack spines and short lateral branchlets. Berberis thunbergii is rounded and densely branched with non-toothed leaves and simple spines. Berberis vulgaris has arching branches, yellow to yellowish red twigs, and more highly toothed leaves (usually 25 or more), but lacks notched petals. Habitat and ecology: This species reportedly grew at one location in St. Joseph County in the late 1800s, but was gone by 1914. It no longer appears to exist in the Chicago Region. Notes: This species is an alternate host for Puccinia graminis, which causes stem rust of wheat, barley, oats, and other cereal crops. Etymology: Berberis is a Latinized form of the Arabian name for barberry. Canadensis means "from Canada." There is some question whether this species is a native or has been introduced. It has been found by the Barberry Eradication Agent along the Tippecanoe River in Fulton, Pulaski, White, and Tippecanoe Counties and along Wildcat Creek in Tippecanoe County. A few scattered bushes were found in Scott and Washington Counties, the habitat or exact location not being given. Nieuwland reported it from St. Joseph County, saying that a clump was found about 1894 near the bank of the St. Joseph River at the Four Mile Bridge and that it had disappeared in 1914. The discontinuous distribution indicates that it might have escaped from cultivation, although there is no evidence that this species was cultivated. Before it was eradicated, I saw long stretches of it on the bank of the Tippecanoe River and it appeared to be native. It was usually restricted to an area a few feet back from the edge of the bank and down the slope to high water mark. Erect, rather sparsely branched, 1-2 m; younger twigs mostly purple, brown, or reddish; lvs obovate to spatulate, 2-6 cm, coarsely spinulose-dentate, the veinlets indistinct beneath; racemes 2-4 cm, with 5-10 fls; pet notched at the tip; fr nearly 1 cm; 2n=28. Rocky woods; mts. of Va. and W.Va. to Ga. and Ala.; Mo. and Ind. May.